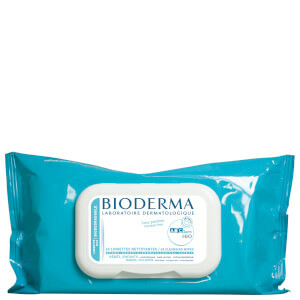 Developed specifically for sensitive skin, the Sensibio H2O Wipes from Bioderma effectively remove makeup from the face and eyes. Take a wipe and gently cleanse and/or remove makeup from your face, eyes and neck. Lightly dab your face with a clean towel. Close packet after use. Aqua/Water/Eau, Polysorbate 20, Allantoin, Mannitol, Xylitol, Rhamnose, Fructooligosaccharides, Disodium Edta, Sodium Citrate, Polyaminopropyl Biguanide, Butylparaben, Methylparaben, Fragrance (Parfum).